If your company is involved in Global Trade as a manufacturer, distributor or logistic operator I give you some key questions you should ask yourself to be successful with your information systems. 1. Does your systems integrate easily with databases (D & B), social networks (LinkedIn), news sites (Google News) and B2B marketplaces (Alibaba, Global Source,… etc) in order to get a better prospecting, sourcing and qualification of your customers and suppliers contacts ? 2. Does your systems give you tools to collaborate online with your customers and suppliers so you can keep track of all your activity with them (requests, quotes, orders, shipments … etc) ? 3. Does your systems easily integrate emails, tasks and events for all involved users (sales people, buyers, operations, etc…) and information from your actual financial or operational systems to have a complete view of all activity related to your customers and suppliers ? 4. Does your systems give yo productivity to generate all your commercial and operational documents? 5. Does your systems have the ability to use any application from the Appexchange marketplace that is the undisputed leader for enterprise applications and utilities? 6. Does your systems give you the ability to develop in the cloud the data structure and functionality that really requires your company, in a way 10 times faster than with the technologies currently in use, and with more security and availability? 7. Does you systems have powerful tools to generate views, reports, dashboards, business rules, workflows, … etc, in order to achieve orderly planning and execution of all marketing activities, procurement and logistics ? We invite you to have a discussion about what you think are your key issues for your CRM & SCM systems in Global Trade and Logistics. Please feel free to ad any comment into this post and we will response you with our best knowledge. 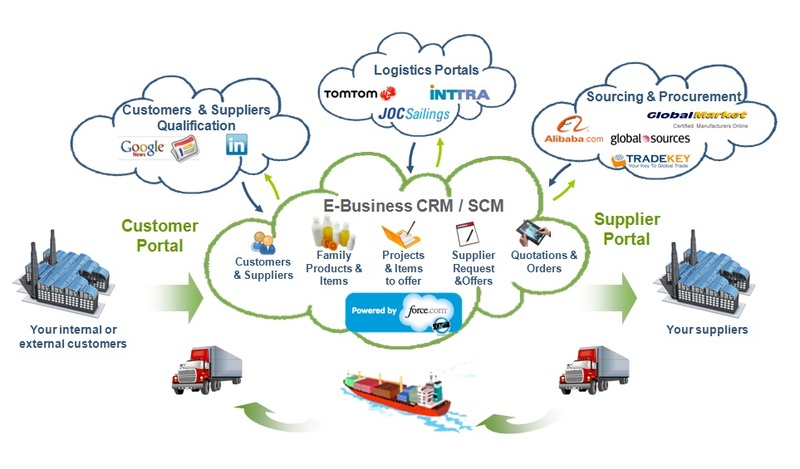 This entry was posted in E-Business ERP, Import-Export, Retail and tagged CRM Online, Force.com, SCM. Bookmark the permalink. Вы хотели бы выглядеть моложе и избавиться от проблем с кожей лица? Мы предлагаем Вам эффективное средство, которое позволяет очистить кожу лица за 1 применение дома.